2 Are there Extras to Consider? I was looking for a compressor for my shop. I had no idea there were so many to choose from. I do wood work for a hobby so I didn’t need anything large or super powerful. I wanted something that I could use in my shop or throw in my SUV to go to a site. So I began the journey of shopping and comparing. I found this Bostitch BTFP02011 Pancake Compressor and liked it right away, but I needed to see if it would work for me. Perhaps you are looking too and this review can help you. 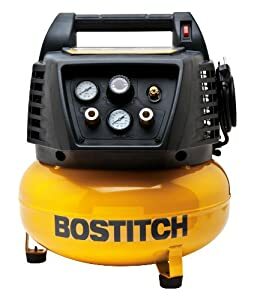 This Stanley Bostitch BTFP02011 is a pancake pneumatic air compressor that is basically made for trim work and wood working. At only 33 lbs, this lightweight machine can do a great deal. Made for the specialist contractor, Bostitch BTFP02011 is a perfect choice if you do cabinetry, moldings, and doorway castings or replace windows. It is definitely a perfect fit for my jobs. This Stanley made compressor impressed me right away with it 450 life hours. It produces 150 PSI max and when it drops down to around 75 PSI it will kick on to replenish. The 6 gallon compressor has more than enough capacity to work for several hours. It is a plus that it is oil free. I was transporting a compressor once and it tipped over and made a mess. This unit is clean and quiet running. It has a reserve tank and can deliver an impressive, efficient 2.6 SCFM @ 90 PSI. So far I am impressed with the power that it has. Amazon.com has the Stanley Bostitch BTFP02011 at a huge savings. It was reviewed by 24+ customers who enjoyed it. The common reviews talked about its portability and the fact that it was very quiet. They raved about the power and capacity of this pancake compressor and stated that it was ready to go right out of the box. They gave it a 4.2 out of 5 stars. I was impressed with the findings of my product investigation. It seemed to me that it not only would be a great addition to my tools, but I bet it would be for yours also. If you are in the market for a pancake compressor give the Bostitch BTFP02011 Pancake Compressor a good look. It is a dependable, quality air compressor at such a great value. Want more Bostitch? Check out our BOSTITCH CAP1512 Oil-free Air Compressor review, or read our best air compressor reviews & our Ultimate air compressor comparison table. Check out other Bostitch Air Compressors too!